Place a pan under the roasting fowl to catch drippings. Mash white bread in mortar. Add garlic cloves and mash well. Add grated cheese and mash like alioli slowly adding ingredients and mashing without stopping. Add 1 c cold water or broth and mix. Add 2 cups hot water or broth and continue to mix. When the capons are done, remove them from the oven and carve them. Put the meat in the mortar with the cheese sauce. Pound this hard. 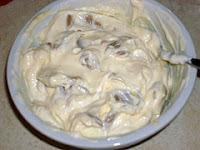 Then take drippings for the capons and add them with 2 tbsp lard to the mixture. When well mixed pour the contents into individual bowls. If a potaje is not desired, make the sauce thicker by adding less water or broth to make the appearance like alioli or mayonnaise. *See blog titled almodrote, published August 23, 2011 for Nola's recipe, blog titled capírotada published September 8, 2012 a Sent Soví version, blog titled cerdo lechon published February 11, 2012 for another Sent Soví version and esparcita published April 25, 2014 for Villena's. Sin duda hay muchas supersticiones en cuanto a la elaboración de la mayonesa y el ali oli: mi madre dice que "en sus tiempos" decían que si la hacías cuando tenías la regla, se cortaba. Será por el cambio de humor y los nervios, será quizá (digo yo, pensando en plan Américo Castro) por la influencia judeo-musulmana de no hacer ciertas cosas en días "impuros"??? Otra cosa con el ali oli que los extranjeros (anglosajones, nórdicos, incluso italianos y franceses menos que los españoles) no pueden soportar es naturalmente el olor, así que interpreto que la alargadera para la batidora no es sólo para hacerlo fuera, sino para no atufar!!! Pero con paciencia, se consigue crear adicción. Porque no me digas que el ali oli no es adictivo... Yo incluía patatas al ali oli regularmente en mis fiestas cuando estaba en Italia. TRANSALATION: There are many wives tales about making mayonnaise and alioil; my mother says that "in her times" they said that if you had your period it curdled. That would be because of changes in feelings (humors would be the medieval explanation) and nerves, this is because (I say, thinking of Americo Castro's idea), because of the Jewish-Muslim influence about not doing some things on "impure days"??? Also, alioli for foreigners (Anglo-Saxons, Nordics, including Italians and French plus Spaniards) can´t tolerate the the smell, thus I intrpret takng the extension cord outside for the food processor, cause it stinks!! But patience, it leads to addiction. Don´t tell me that alioil is not an addiction. . . I included potatoes with alioil all the time at my parties when living in Italy. Somehow this got posted under garlic cheese sauce with is fine because it is also adictive! Please try my recipe and send your comnets! VERY adictive indeed! My husband was not confident in the beggining of its been really medieval, but he liked it so much that ever since everytime I make a new recipe he asks me if it is medieval too! I modernised a little the recipe pouring it like a sauce over some roast chicken.